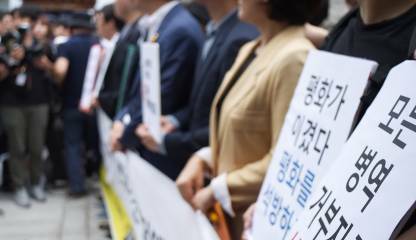 (02.11.2018) South Korea's top court ruled Thursday that South Korean men can legally reject their mandatory military service on conscientious or religious grounds without punishment. The landmark ruling is expected to affect the cases of more than 930 conscientious objectors on trial. 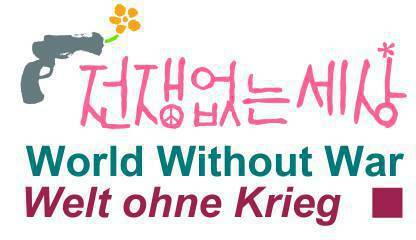 Hundreds of young South Korean men, mostly Jehovah's Witnesses, are imprisoned every year for refusing to serve in the military. 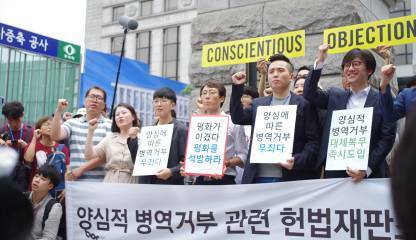 (22.07.2018) The Constitutional Court is poised to conclude another milestone conscientious objection case, weeks after a historic June 28 ruling where it overturned South Korea's long-standing stance to alternative military service. The top court will wrap up a class-action complaint filed in 2011 by 433 conscience objectors who claimed that they were human rights victims but that they were unable to get adequate compensation from the government because of the absence of legislation. Those who filed the complaint urged the top court to take necessary measures, so the government could compensate them and expunge their criminal records. 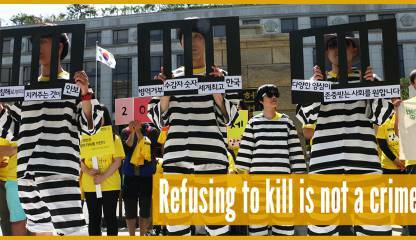 (18.07.2018) A South Korean conscientious objector was sentenced to a jail term Tuesday, despite the recent Constitutional Court order for the government to introduce civilian forms of service for them. Seoul Western District Court ruled Tuesday that the man, surnamed Oh, must serve 18 months in prison for not complying with the country’s mandatory military service. Oh, 30, says that his political beliefs go against serving in the armed forces.